I started the year with a plan. This would be the year that I will get my life together. I won't let the dishes pile up, I'll make the bed every day, I'll get my eyebrows waxed before they grow together (and not in the cute, big eyebrows are so in kind of way) and I'm going to learn to take care of my skin. I can't say that my life goals for 2019 have all panned out or lasted into February, but I am happy to report for the first time in my adult life, I have actually established and maintained a skin care routine. And yes, I'm 34 years old. When I was a pre-teen and teen I had acne. My mom, bless her, took me to the dermatologist, where they would recommend harsh medications and creams that made my skin red and extremely sensitive, peeling what felt like layers and layers of skin. I never stuck with it because of the side effects and always just assumed I was cursed with oily, acne prone skin. As an adult, things mostly evened out, although I was of course prone to hormonal breakouts, until I started having babies. While my skin didn't break out as often, when I did get a pimple, I was prone to hyper-pigmentation afterwards, which left dark red dots and marks in the place of a long gone pimple. My youngest is 20 months old and to this day, if I get a pimple, I know it will leave a mark on my face that will take months (sometimes years) to fade. It's been incredibly discouraging and I feel like a teen who has to hide her skin all over again. Add in my age and the onset of wrinkles and honestly, I felt like my skin was a battle that I would never win. In January I set out to just get to know my skin. 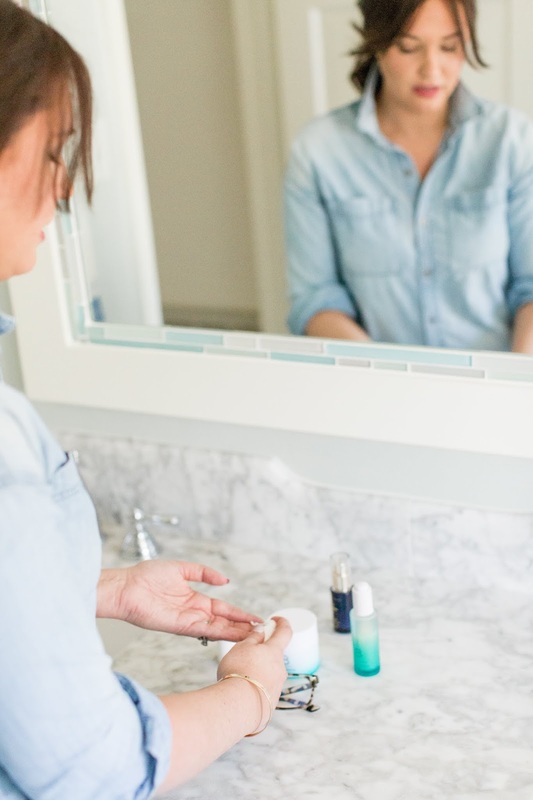 To start a process of trying new products to determine what was going to work best with my skin type (which I assumed was combination) and to take the time to really find what was going to work best for me. 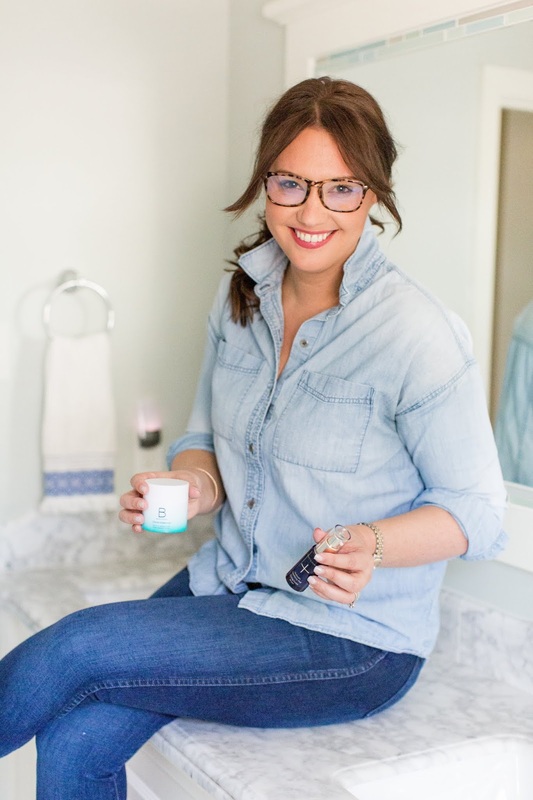 I was willing to try new brands, product lines and products that I never would have before, in the attempts to find my best face. I decided to start with Beautycounter. Why? Honestly, I've tried many lines (ProActive, Tula, Clinique) and Beautycoutner seemed to be the next step. I took the online Skincare Quiz and Beautycounter suggested that I use the Countermatch System. I took advantage of a sale and ordered the entire system. 30 days later, here are my completely untouched, totally exposed, I can't believe I've putting this on the internet, before and after photos. and there are no new breakouts. 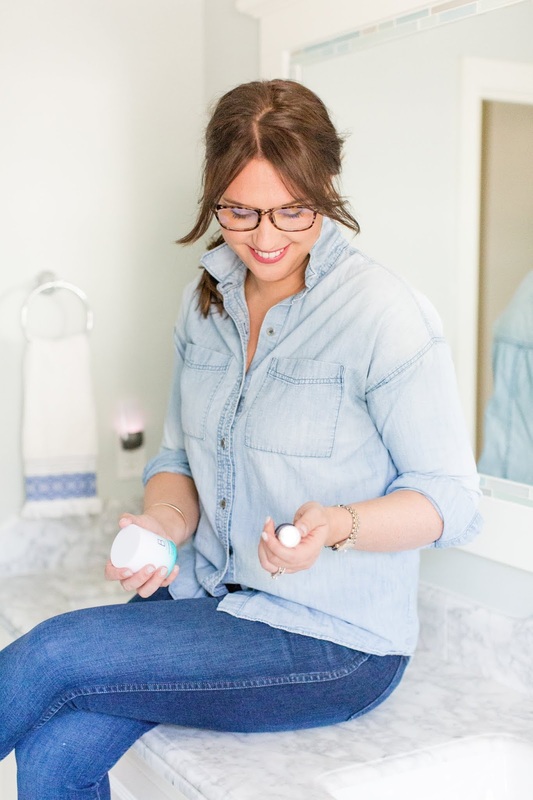 Let me be clear that this post is not sponsored (although it does contain affiliate links), I purchased my own products and I, in no way, expected there to be any noticeable changes in my skin in just 30 days. And here I am, a month later, shocked about what I didn't know about my skin. I assumed that my skin was incredibly oily and acne prone, when in fact, it is very dry. Most of my acne has been a result of two things: hormonal shifts and dryness. I am now moisturizing my skin in a way that would shock my 13 year old self. This level of moisture is helping to soothe my skin, reduce my breakouts and hopefully make this old mug look a little younger. Pure Calm Cleansing Milk: very mild, soft cleanser that in no way exfoliates or irritates the skin. At first, I couldn't even imagine it was getting my skin clean since I'm used to basically punishing my skin for breaking out. I love how soft and smooth it leaves my skin. Intense Moisture Serum: for me, this product was a nice mix of a traditional moisturizer and an oil, so perfect for daytime and post cleansing. The dispenser on the bottle isn't my fave but I love the product itself, especially if you have combo skin and are looking for a medium weight serum. Adaptive Moisture Lotion: when paired with the Serum, I am in love with this lotion. It will be the perfect weight for summer moisturizing if you happen to have skin on the dryer side of combo - if your skin is very dry, this won't be the lotion for you, and in the winter, I might need a bit more in certain areas, but for my T-zone especially, this lotion is a winner. The evening routine makes me so happy - something I would have never dreamed I would say two months ago. Occasionally (maybe every other week) I used the Balancing (Charcoal) Mask to tighten my pores. Followed by the Resurfacing Peel: the peel requires you to start off using it every few days but you can work your usage up. I now use it every night, allowing it to settle in for a few minutes before moving on to night cream. The peel is amazing and is responsible for lightening my dark marks and softening my fine lines. Recovery Sleep Cream: as classic night cream that feels super rich when applied. I love the somewhat neutral scent and how it feels on my skin after the peel. Number 3 Balancing Oil: I am still shocked that I am using an oil on my face. For someone with what I thought was acne prone skin, this is somewhat mind blowing, but I am and I love it. The oil leaves my skin soft and glowy, which is noticeable even when I wake up in the morning. Overall, I am thrilled with results after just 30 days. My plan is to give daytime oils a try and branch into the Rejuvenation line for deeper moisture for the remaining winter months. 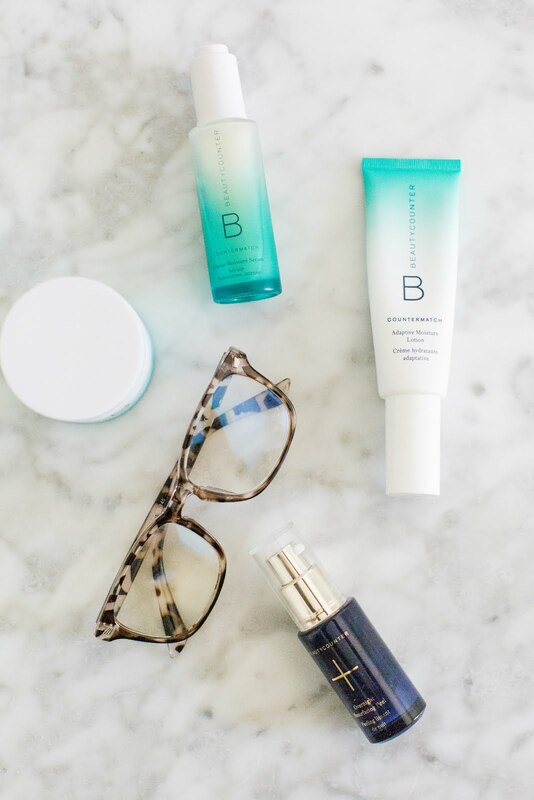 If you're interested in Beautycounter, start with the Skincare Quiz, it absolutely lead me in the right direction and exposed me to products that I never dreamed I would need. As I add in new products and establish my routines for my face (and body! ), I'll report back! I have been wanting to try this line for a while! My recommended regime is Countermatch!